..TIME TO GO,TOKKA !! Silly Snapper ..slidin' to San Diego .. on the south bound slime-bus from SoHo .. oi ..
..it's time.. wish me luck ,gang.. !! -Posted the previews for Tales of the TMNT #36 and Raphael - Bad Moon Rising #1. -Posted the extended synopsis (with screenshots) for **Episode #130 "The Journal" .. ..and .. **Episode #129 "Bad Blood"
- I thought I'd throw out an actual "announcement." A couple years ago Peter Laird reprinted TMNT #1 with new inks, toning, letters, and script. Yes, that's a lot of changes. I've setup a webpage that give you the opportunity to compare the new version to the old. And you can come to whatever conclusion you want to come to concerning the changes. Since it's my webpage, you get (a very reserved version of) my opinion there. ** CLICK HERE ..to compare !! - Many, many years ago, "The Forever War" was to be the last story arc of the Teenage Mutant Ninja Turtles Adventures title published by Archie comics. But Archie pulled the plug on the series early and the story never came to be. For several years Mirage has been saying that they would complete and publish this story, but it hasn't come to be. Now word comes from Steve Murphy that "The Forever War" will be published as part of the TMNT's 25th Anniversary in 2009. A trade paperback collecting related issues will also be published. .. ok .. i'll also keep my beak out for TMNT spots n' slorts n' Turtle tid-bits at CON .. B.B.L .. - out !! "On behalf of Lionsgate Home Entertainment, we are pleased to announce the DVD release of Teenage Mutant Ninja Turtles Season 5 available August 7th. This 3-disc set features all 18 episodes from the fifth season starring Leonardo, Michaelangelo, Raphael, and Donatello as they embark on shell-kicking adventures against their arch-nemesis, Shredder, and features customized, pizza box packaging sure to excite fans of the popular classic television series. A true pop culture staple, the Teenage Mutant Ninja Turtles franchise has enjoyed success spanning multiple generations and 2007 marks the 25th anniversary of the sewer-dwelling action stars. The popular classic television series of the 1980s and 1990s has enjoyed phenomenal success on DVD with more than 800,000 units shipped to date. Please see the links below to access the box art, packaging, and production fact sheet. Your order for hot, fresh kung-fu action has arrived as Lionsgate releases the special delivery DVD box set of Teenage Mutant Ninja Turtles Season 5 this August. Complete with customized, pizza box packaging sure to excite fans of the popular classic television series, this 3-disc set features all 18 episodes from the fifth season starring Leonardo, Michaelangelo, Raphael, and Donatello as they embark on shell-kicking adventures against their arch-nemesis, Shredder. A true pop culture staple, the Teenage Mutant Ninja Turtles franchise has enjoyed success spanning multiple generations and 2007 marks the 25th anniversary of the sewer-dwelling action stars. The popular classic television series of the 1980s and 1990s has enjoyed phenomenal success on DVD with more than 800,000 units shipped to date. In addition, the all-new television series, TMNT Fast Forward, currently airs daily on Fox's 4Kids TV programming block, boasting more than 1.2 million viewers and reaching a whole new generation of fans. Title Copyright: TEENAGE MUTANT NINJA TURTLES®, related characters and the distinctive likenesses thereof are registered trademarks of Mirage Studios, Inc. All contents Copyright © 2007 Mirage Studios, Inc. unless otherwise noted. All Rights Reserved. TEENAGE MUTANT NINJA TURTLES® created by Peter Laird and Kevin Eastman. Disc and programs © 1990, 1991, 1992 Fred Wolf Films. All Rights Reserved. Based on the TV show produced by Fred Wolf Films. - D L X TMNT DVD info courtesy of Roseangelo ..
** Click here for purchase info from EZYdvd..
Pre-order this item and we'll include Free Delivery via Australia Post Surface Mail (Australia Only) We do not charge your card until your order is ready to ship. They're back... and they're ready to kick some shell! After the defeat of their old arch nemesis, The Shredder, the Turtles have grown apart as a family. Struggling to keep them together, their rat sensei, Master Splinter (voice of Mako), becomes worried when strange things begin to brew in New York City. Tech industrialist, Max Winters (Patrick Stewart), is amassing an army of ancient monsters to apparently take over the world. And only one super-ninja fighting team can stop them – those heroes in a half shell – Leonardo, Michelangelo, Donatello and Raphael! With the help of old allies, April O’Neil (Sarah Michelle Gellar) and Casey Jones (Chris Evans), the Turtles are in for the fight of their lives as they once again must face the mysterious Foot Clan, who have put their own ninja skills behind Winters’ endeavours. Making this new incarnation of the Teenage Mutant Ninja Turtles truly cutting-edge, the film is created entirely with-state-of-the-art CG animation, giving them a completely new look for the 21st century. It looks like there could be a sequel to this year's CGI-animated movie TMNT - Teenage Mutant Ninja Turtles. Because the film had a relatively small budget - when I say small I mean around $34 million- and the fact that the film made just over $90 million at the box-office - it has now been said that a second adventure is "70% sure" of happening. Mirage Studios Steve Murphy told The 5th Turtle: "As of two weeks ago Imagi Entertainment (the TMNT movie animation studio) informed Mirage Studios that there was a 50-50 chance of a CGI film sequel. Last week they upped the odds to 70-30 in favor of a sequel, as talks between Imagi and their distribution partners Warner Brothers and the Weinstein Group seem to be heading in a positive direction." thought you sold the Turtles? - ** Posted the extended synopsis (with screenshots) for Episode #129 "Bad Blood"
- Vaughn Michael sent in boxed images for the 1994 toys **Air Force Mutation Donatello and Construction Mutation Leonardo. 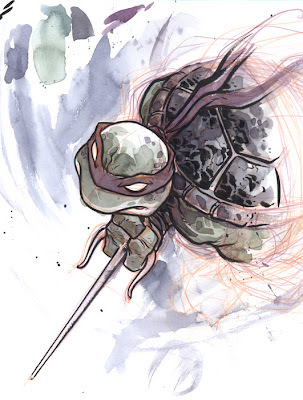 -Posted Donatello #1 - now you can read the entire comic on our site and see how it compares to Episode #16 of the cartoon series. - Halloween costume news: Morris Costumes will be producing Adult-sized TMNT costumes this year! The costumes will have a MSRP of $149.90. When the season draws nigh, they will be available at **HalloweenExpress.com - mark your calendars now - they may go fast judging by the amount of mail we've gotten about them over the past few years! Not sure if any of you watch episodes of 'Fast Forward' on Comcast's On Demand but it appears a brand new episode is available, one not among those listed in the episode guide. It is entitled 'Head of State.' By far, one of the best episodes of this new series [especially due to its guest stars]."